"Why", "She's Country", "Big Green Tractor", "The Truth", "Don't You Wanna Stay" (Duet with Kelly Clarkson), "Dirt Road Anthem", "Fly Over States", "Take a Little Ride", "The Only Way I Know" (a collaboration with Luke Bryan and Eric Church), "Night Train", "When She Says Baby" and "Burnin' It Down" all are number one hits for superstar entertainer Jason Aldean. Born and raised in Macon, Georgia, Jason Aldean wanted to perform on stage since age 14. His father taught him how to play guitar and his mother would take him to perform at the local VFW hall. At 15 he joined the "house band" at Georgia nightspot Nashville South. After High School with his father's help Jason and his band performed at Truman State University. He was offered a record deal with Broken Bow Records in Nashville. 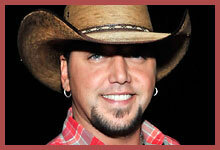 His first number one hit "Why" was off his debut album Jason Aldean in 2005. With sales totaling over 21 million in downloads, Jason Aldean is the Top Digital Male Country Artist in history. Jason is currently headlining his "Burn it Down" tour.